Pioneers in the industry, we offer banana fibre mottled paper from India. These types of handmade papers are made out of 100 % banana fibres. Banana Fibre Mottled Papers are extracted from banana leaves and refined thereafter. 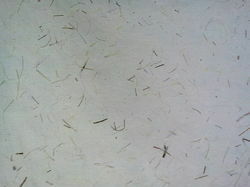 These fibres are used to make handmade papers. Banana fibre handmade papers are very exquisite papers. Banana fibre papers can be made in different varieties such as 100 % banana fibre with long strands, with completely crushed fibre, mixed with cotton, tissue paper, etc. Banana fibre papers are very strong and have a very long life. These papers could be used for number of purposes including archival purpose, lampshades, etc. These papers can be made with minimum 40 gsm tissue paper.